After staying in Koiwa for a few days we took the Shinkansen to Kagoshima in Kyushu. Most cities have a couple of major rivers and Kagoshima has both the Inari and the Kotsuki. We'll spend the next couple of weeks looking at the bridges that cross these rivers. Today's bridge carries Route 10 over near the mouth of the Inarigawa. We can see the very active Sakurajima volcano across the bay. This volcano sprays clouds of ash across the bay onto Kagoshima almost every day. At the beginning of 1914 very large earthquakes alerted residents to flee before a large eruption of molten lava covered Sakurajima Island, turning it into a peninsula. There were at least three eruptions of ash while I was photographing today's bridge. The ash slowly moved across the bay and covered us with grit (the sidewalks and roads are all covered in ash). There have been over 500 eruptions in 2013 including one that generated lightning and another that rose 5000 meters and caused total darkness. More information on this volcano can be obtained at the Wikepedia website. The Route 10 Bridge is a two span highway structure with both a steel box girder and I girders (the bridge may have been widened at some point). There are pedestrian undercrossings going through each approach. The superstructure is on a reverse horizontal curve and supported by seat-type abutments and a hammerhead bent. This bridge (like every other bridge in Japan) has been seismically retrofit with restrainers connecting the abutments and bent cap to the girder soffit. It is fairly unadorned by Japanese standards with a stone-like facade on the retaining walls, the curbs, and on the bent, a wind surfing motif on the barrier rails facing the bay, and a bastion facing the bay. 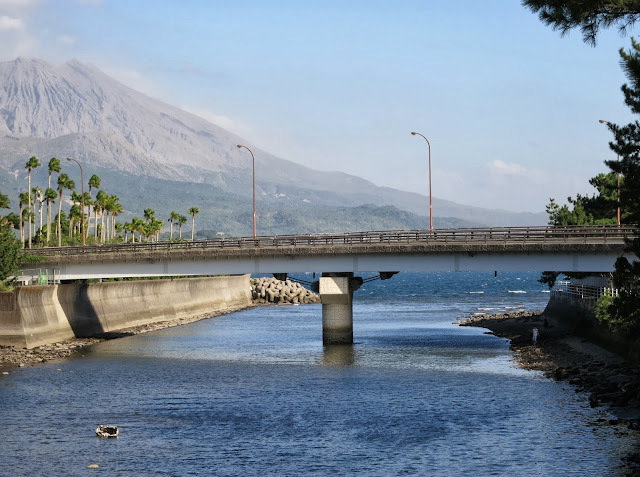 Kagoshima Prefecture, Japan's Bridges: 1: Route 10 Bridge across the Inarigawa by Mark Yashinsky is licensed under a Creative Commons Attribution-NonCommercial-NoDerivs 3.0 Unported License.